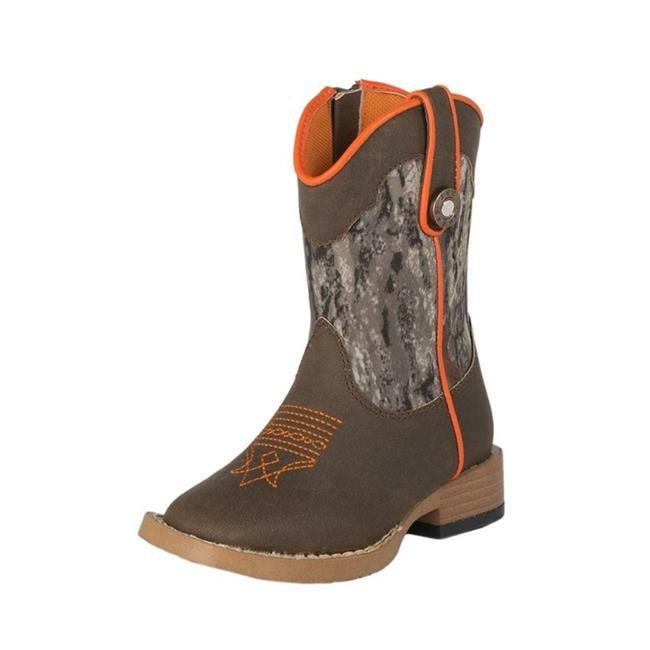 Your little toddler needs a great pair of boots to show his country roots, and this is a great pair to start him out. The DBL Barrel Buckshot boots feature Mossy Oak Camo print on the shaft for a unique western look. The chocolate brown faux leather foot has contrasting orange stitching for kid-like character. A chocolate brown collar complements the camo print, with fun orange piping down the outside seam. The square toe adds grown up character. The practical details include a removable insole with moisture wicking technology keeping your little guy's feet cool and comfortable despite the elements. A slip resistant out sole makes them a safe option because once he sees them, he will never want to go without them.